Lee Bradbury insists the Hawks must continue on a roll at home as they host fellow Vanarama National League strugglers Maidstone United. A third successive Westleigh Park victory is the target on Saturday (3pm). Home wins against Maidenhead United and FC Halifax have lifted Bradbury’s troops. They got a good 0-0 draw at Chesterfield last weekend and the feeling is positive around the club. In that game Bradbury's team displayed great defensive resilience, helped by another inspired display from goalkeeper Ben Dudzinski. Continuing to grind out points away from home will increase the Hawks chance of staying up. Bradbury knows wins at Westleigh Park will be the big factor, though. He said: ‘In our past three or four games our players have shown they are learning to compete at the higher level. ‘Our Chesterfield performance was one of our bravest so far this season. ‘We can take a lot of confidence from the way we defended and worked hard for each other. ‘The home games, though, are going to be the key. ‘This is another opportunity for us to do well against a team in the bottom half of the league. ‘These are the games we need to win. ‘There are about seven or eight teams at the bottom and we want to make sure we stay at the top of that group. New signing Djamel Leeflang is expected to be in the squad after missing out on a home debut in midweek. 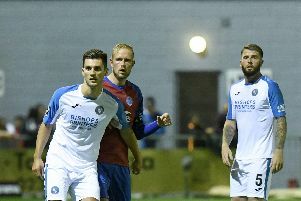 Bradbury intended to give the Dutch-born midfielder his first full start in the Portsmouth Senior Cup tie against United Services Portsmouth. His plans were scuppered, however, when he discovered the player was ineligible to play as he had not been signed before the cup deadline. Fellow midfielder Ibra Sekajja was able to return after injury against the Wessex League side and came through unscathed. Both players could be included on the bench. Unfortunately Bradley Tarbuck had to come off and Bradbury doesn't think he will recover in time. Defender Will Wood is also ruled out by suspension. Bradbury is predicting a tough battle against the Kent visitors. He wants his team to take command early on. The Hawks boss added: ‘Maidstone have brought in a new manager and he has already made some good signings. ‘In recent home games we have started with a good tempo and got on the front foot early.